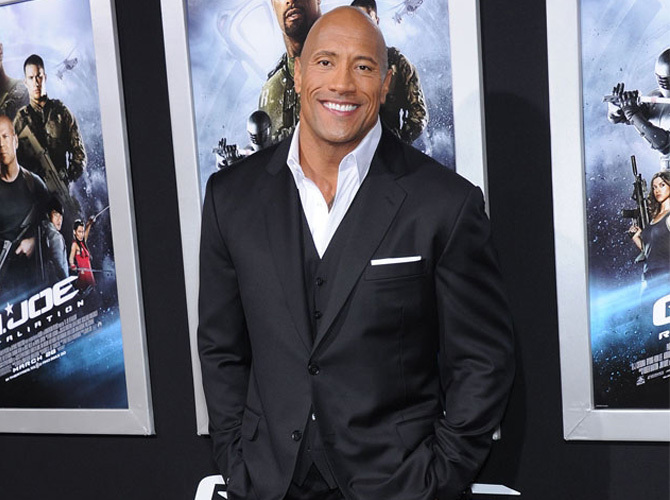 Yep, Dwayne "The Rock" Johnson has been named 2013's top-grossing actor. The four movies the 42-year-old star appeared in this year—Fast & Furious 6, G. I Joe: Retaliation, Pain & Gain, and Snitch—banked a collective $1.3 billion at the global box office, putting him just ahead of second-placed Robert Downey Jr., who only released one movie in 2013, Iron Man 3, which took $1.2 billion. Sorry, Robert. Not this year. Despicable Me 2 star Steve Carrell ranked third, with his work —including The Way Way Back and The Incredible Burt Wonderstone—bringing in $964 million, while WWE Superstar Dwayne's Fast & Furious 6 co-star, Riddick actor Vin Diesel, placed fourth with $887 million. Gravity and The Heat's successes with audiences helped propel Sandra Bullock to number five in the list—compiled by Forbes magazine—with her movies grossing a total of $862 million this year. In sixth place was another Fast & Furious 6 actor, the late Paul Walker, who passed away last month after a car accident, bringing in $789 million, all of which came from the latest installment of the action franchise. Tied in the seventh spot were Monsters University stars Billy Crystal and John Goodman, with the animated tale bringing in $743 million. Thor: The Dark World and Rush actor Chris Hemsworth's 2013 work grossed $701 million, ranking him ninth, and Hunger Games: Catching Fire actress Jennifer Lawrence completed the top 10 with box office takings of $700 million.